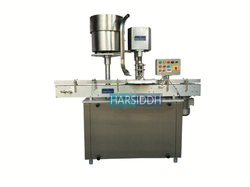 Our range of products include bottle cap sealing machine. Keeping pace with sophisticated technology, we manufacture and supply best quality Bottle cap sealing machines. Incorporated with user friendly features, these Bottle Cap Sealing Machines are used to seal bottles with metallic and plastic caps of different sizes. These dimensionally accurate machines are stringently tested by us to ensure that they are free from any type of defect.